JOGGING AND WALKING FOR HEALTH 1. It is well documented that for every mile you jog, you add 1 minute to your life. This enables you at 95 years of age....to spend an additional 5 months in a nursing home at $5,000. per month. 2. My grandmother started walking five miles a day when she was 60. She's 97 now and we don't know where she is. 3. The only reason I would take up jogging would be so I could hear heavy breathing again. 4. I joined a health club last year and spent about 400 bucks. Have NOT lost a pound. Apparently you have to show up. 5. I have to exercise early in the morning before my brain figures out what I'm doing. 6. I don't exercise at all. If God meant us to touch our toes, he would have put them further up our body. 7. I like long walks, especially when they are taken by people who annoy me. 8. I have flabby thighs, but fortunately my stomach covers them. 9. 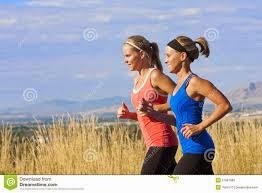 The advantage of exercising every day is that you die healthier. 10. If you are going to try cross-country skiing, start with a small country. 11. I don't jog, it makes the ice jump right out of my glass.